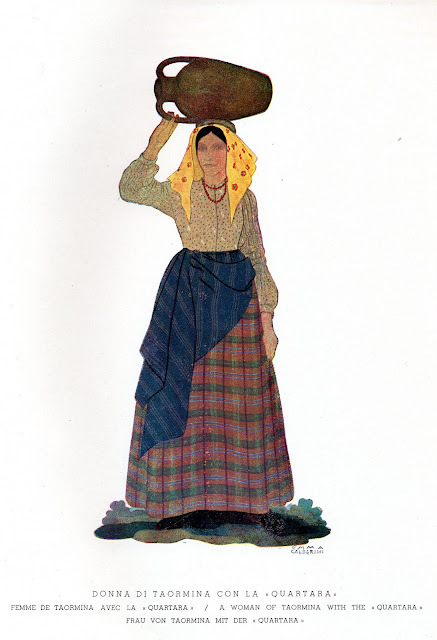 FolkCostume&Embroidery: Is there a Sicilian Folk Costume? Folk costume, while having its roots in the deep history of an individual local community, was to some extent the result of the romantic-nationalist movement of the 18-19 centuries. It was partly self-expression of the textile artists of an area, and partly a method of proclaiming and promulgating ethnic identity. It was based on the domestic manufacture of clothing in the home or at the local level, the local traditions of ornamental weaving, embroidery, leatherwork, etc. One of the mysteries of this field of study is why some regions developed a rich varied local costume tradition and others did not. A classic example is the Netherlands, which have a very rich [if rather bizarre] folk costume tradition [in spite of Calvinism], while Belgium does not. Belgium has a folk culture very rich in other areas, but never developed any distinct folk costumes. [If anyone has information otherwise, please let me know] When the Belgian people put on folk festivals, or folk dance performances, they copy costumes from the paintings of Breugel, which fortunately show a lot of detail. Another such example is Sardinia and Sicily. It is true that the two peoples are not closely related, the local languages are very different, yet much of the history is similar for these two neighbors. 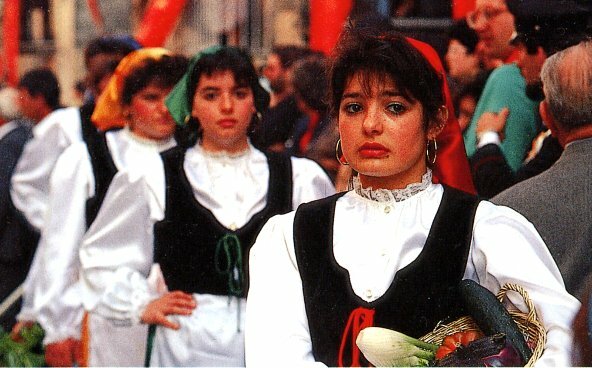 Again, Sardinia has a very rich folk costume tradition which is very much alive today, [to which i will devote several future postings] while Sicily seemingly does not. I feel that i must state that Sicily is very rich in folklore, in the form of festivals, traditions, music, stories, food of course, etc. I do not know of any tradition of peasant costume, however. 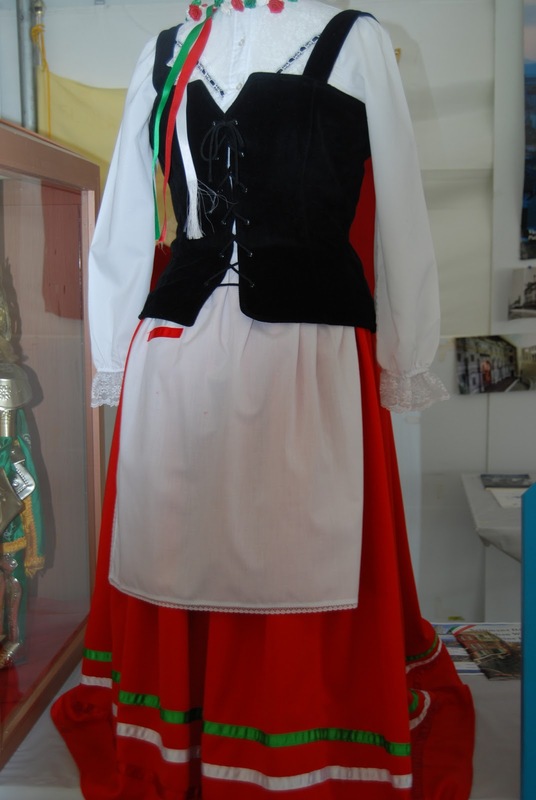 Here is an example of the first category, This is the Albanian costume of the area known as Piana dei Greci or Piana degli Albanesi. I will do a future posting on this costume, i am sure. While it is very beautiful, it is not properly a costume of the Sicilian people. [I do feel that there must have been influence from Italian costume sometime in the past. This costume is not worn in Albania]. This costume is very widely copied on postcards and the like however,because it is very colorful and genuinely native to Sicily. I got this photo from a Sicilian Informational website. For the mens costume there is not a real distinction between period dress and the generic. It consists of a white shirt, red bandanna, ribbon or cord with pompoms on the ends tied around the neck, brown or black vest, brown jacket, usually corduroy, cut like a modern sports coat, knickers, white over the knee stockings, low black shoes, possibly a red sash and either a felt hat or red or black stocking cap, the latter being very widespread for mens costumes around the Mediterranean. This is also the standard mens costume for much of Italy. Here are some photos showing this costume. Here is what i think is the same man and his son driving two different carts. The Painted carts of Sicily are a very famous part of its folklore. 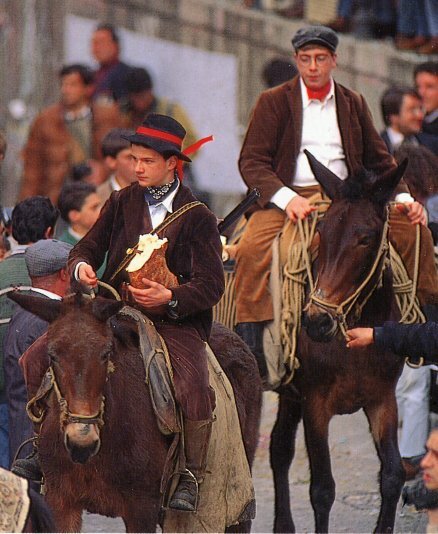 Here are two young men riding in the festival called 'Mastru di Campu' in Palermo. 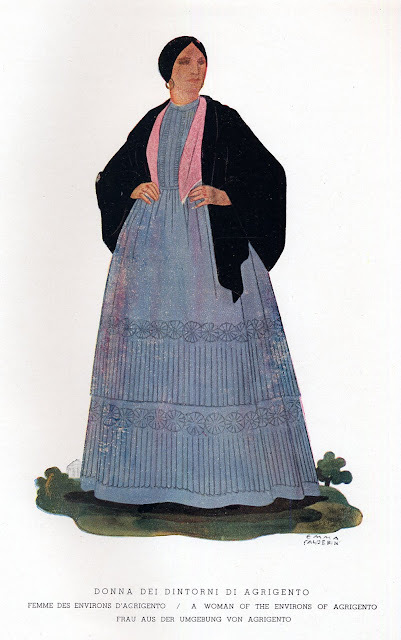 Here is a plate from Emma Calderini which substantiates this costume. This gentleman is wearing striped stockings covered with short gaiters as well. 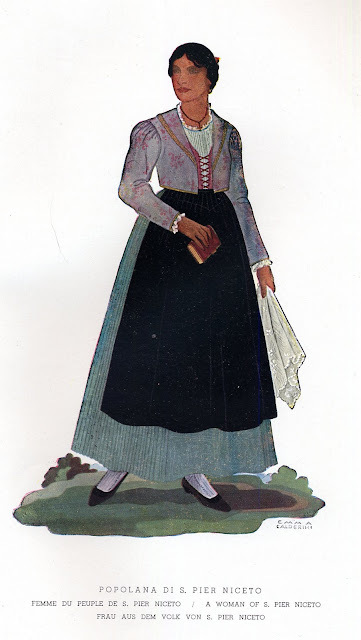 For the women, the generic costume consists of a white blouse with wide sleeves, often trimmed with lace, a simple black bodice, a kerchief, a full skirt usually in red or green, trimmed with ribbons, and a white apron. Here are some young women taking part in the festival of 'Li Schietti' in Calatafimi. 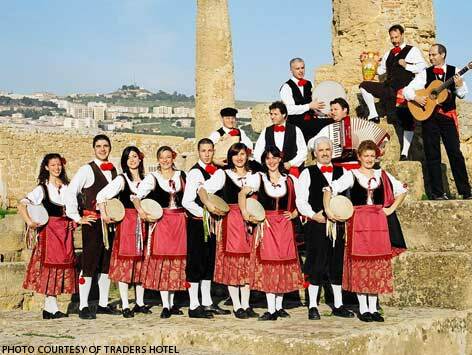 ﻿Here are a couple of videos of amateur dance groups in Sicily using versions of this generic costume. This is another example, i admit i don't remember where i got it, from a Tourist information site, no doubt. Here is a still from a video of another amateur dance group from Sicily. You will notice a wide variation in the length of the skirts. On the one hand, one might say these were not 'authentic' because i am not sure that people in Sicily ever dressed this way. On the other hand, it has now become a tradition in its own right. The third type of costume seen is typified by these prints from Emma Calderini, whose work i have found copied over and over by other artists. She seems to be the source material for many who came after. 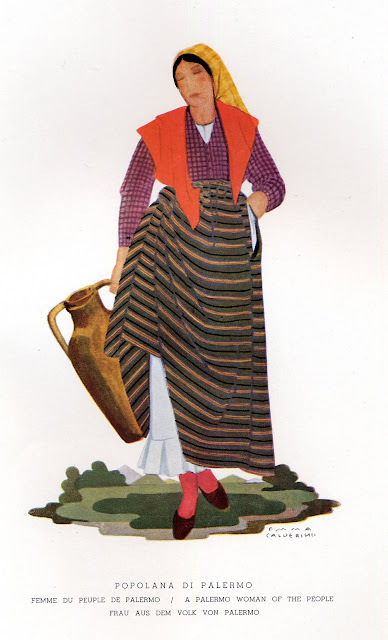 Very elegant, but i am not sure that they fall in the category of 'Folk Costume' rather than 'Period Costume'. Perhaps the distinction is irrelevant, and certainly traditional costume in western Europe is closer to modern western clothing than it is in central or eastern Europe. One does not seem to see costumes as distinctive in their way as one does in Sardinia. These three ladies seem to be well off, or at least dressed up to go to Church or an Occasion. Calderini also provides a couple of prints showing women who were either less well off, or maybe just working in their everyday clothes. You will notice that none of these resembles the 'generic costume'. This type of costume is sometimes used by performing groups, like this one. 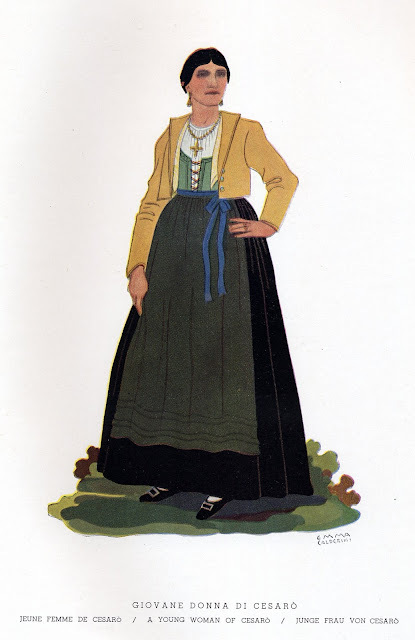 I have also seen a couple of groups wearing what looks like a dirndl. Perhaps they took this type of costume and just shortened the skirts. It is amazing what is online these days. 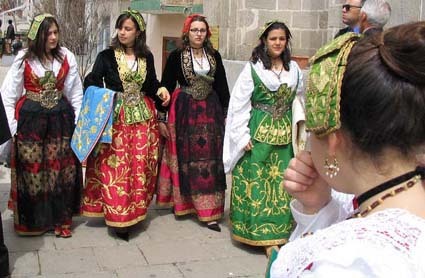 ﻿If anyone has more information, or knows of sources for more information on Sicilian costume, or Italian costume in general, please let me know. Thank you for reading, as always, and i hope that this provokes some thought and causes more infomation to come out. I do not know of any place which stocks such costumes. The best thing would be to collect some good photos and take them to someone with a lot of sewing experience to have them made. I could help you with more images. Where can I buy a costume for me (woman) ? I live in France. My parents was born in sicilia. Near Palermo. I'd like to buy a costum for my wedding . But Where ? 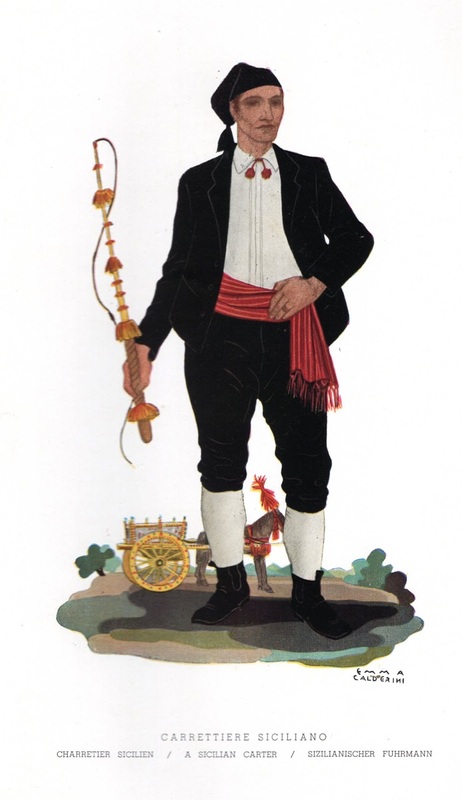 I am interested in sicilian dress throughout the years. my gr grandparents were from terrasini near palermo. mine were from there also. have you found out? I am interested for my art. My Grandfather was from Terrasini As well. 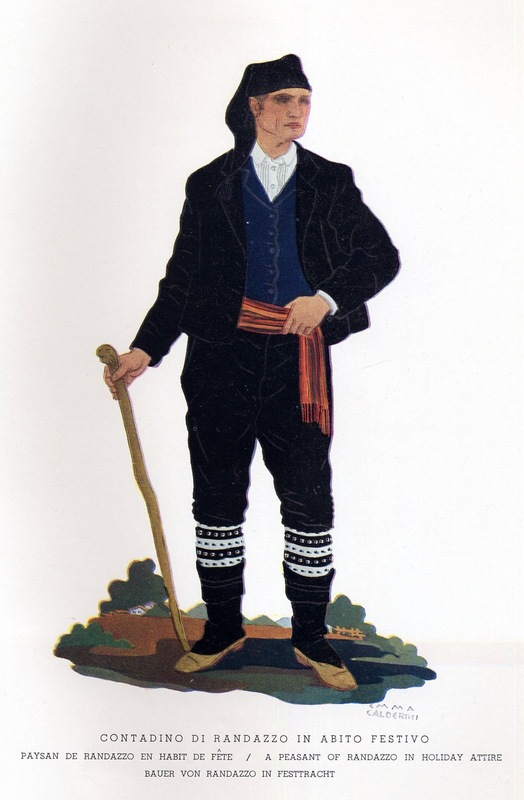 I would like to see traditional dress from Terrasini too. If anyone has any photos please post. Thank you! Il costume tradizionale di Piana degli Albanesi esprime, così come la lingua e il rito religioso, la diversità culturale arbëreshë, e manifesta la forte volontà di conservare identità e tradizioni. Dal punto di vista storico Piana degli Albanesi è la comunità Arbëreshe più importante di Sicilia e tra le più in rilievo d'Arbëria, e se non si hanno molte notizie specifiche riguardo ai costumi esistono, però, documentazioni iconografiche e notevoli cenni su testi letterali di scrittori locali, come il Pitrè, che ne testimoniano l'esistenza plurisecolare. Sugli abiti dei greco-albanesi di Piana degli Albanesi esistono diverse dipinti, tra cui molto preziose le stampe di Vuillier, del XVIII secolo, le pitture e gli schizzi di Ettore De Maria Bergler, i ritratti di Antonietta Raphaël, in parte conservate alla Galleria d'Arte del complesso monumentale di Sant'Anna a Palermo, acquarelli e cartoline di autori sconosciuti che ritraggono e testimoniano la bellezza del costume di Piana degli Albanesi. Gli abiti tradizionali, legati ai vari momenti della vita delle donne, dalla quotidianità al matrimonio, scandivano i ritmi della tradizione sociale del passato. Tramandati di madre in figlia e conservati gelosamente, oggi non sono più abiti di uso quotidiano, ma costumi che hanno solo funzioni simboliche e vengono indossate solo in alcune occasioni.